It's a story that truly spans the globe: Activists from all over the world, including San Francisco, are trying to stop the construction of a dam in Ethiopia financed by a Chinese bank. The Gibe 3 Dam is in the early phases of construction on Ethiopia's powerful Omo River, using $500 million dollars in equipment funded by the Industrial and Commercial Bank of China (ICBC). The hydroelectric dam, one of the largest construction projects in Ethiopia's history, would regulate the flow of water along the Omo River as it courses through Ethiopia and into Kenya's massive Lake Turkhana -- a freshwater oasis in the heart of the desert. The project has been mired in controversy since it was just a blueprint. The World Bank and the European Investment Bank financed smaller hydroelectric projects on the Omo River, but dropped consideration of the Gibe 3 Dam after viewing the environmental impact report commissioned by the Ethiopian government. Activists say the World Bank and the African Development Bank lost interest in the project after considering its social and ecological implications on the region's fragile ecosystem stretching across Ethiopia and northern Kenya. The European Investment Bank also dropped consideration of the Gibe 3 Dam, although its reasons for doing so are unclear. A November 2010 hydrology report by the African Development Bank (pdf) (AfDB) noted that the Omo River is responsible for 90 percent of the water leading into Lake Turkhana. A major dam blocking the river would drain most of the lake, depriving 300,000 Kenyans of the water needed for agriculture, cattle herding and fishing. And that's just the first concern: The activists' extended list of fears about the dam seems as long as the Omo River itself. Any changes to the Omo River's natural flood pattern could affect 70 percent of the "more important" species living around Lake Turkhana, according to the AfDB report. Also, in the long term, independent Ethiopian engineers have questioned the wisdom of building such a large dam in a region with a history of strong earthquakes. That's not all. The area that will be flooded by the dam is home to low-level farmlands used by 300,000 Ethiopians. Food resources are already so scarce in the drought-hit border region between Kenya and Ethiopia that two of the main ethnic groups living there have resorted to violence in their bid for more land and water. In May, 70 ethnic Turkhana people from Kenya were killed when they attempted to buy food across the border in Ethiopia. Landlocked Ethiopia is starved for electricity and also hopes to boost its revenue by exporting hydroelectricity. One section of the Kenyan government has already signed a Memorandum of Understanding to buy hydropower from the Gibe 3 dam. In a fax to CBS, the ICBC noted "relevant nations expressed interest in buying electricity from Ethiopia." However, Friends of Lake Turkhana, an activist group battling the dam, is taking the Kenyan government to court to fight the agreement to buy electricity without conducting a full environmental impact assessment on the dam. 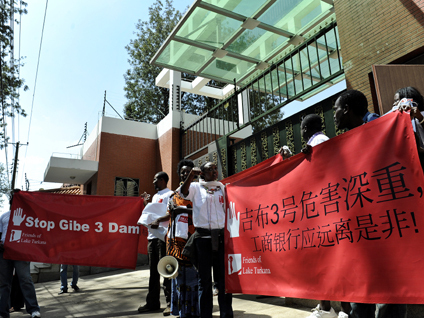 Now that the ICBC bank in China is offering financial support for the dam, the Kenyan opponents to the dam are widening their campaign to stop construction of the Gibe 3. The ICBC Bank has long been silent on its reasons for supporting controversial Gibe 3 Dam, until now. Activists from Kenya and International Rivers flew to Beijing to plea their case to the ICBC, but their meeting requests were ignored. So, I contacted ICBC Bank to ask about the widespread concerns regarding ecological and safety risks of building the GIBE 3 Dam. Days later, the unsigned letter from ICBC faxed to CBS News insisted, "credit and loan for all projects conforms to environmental requirements." Further, the bank argues that other, smaller hydro projects on the Omo River, Gibe 1 and Gibe 2, were supported by the World Bank, the European Investment Bank and other financial institutions. The fax did not answer CBS News' question as to why the ICBC continues to support the Gibe 3 project when other financial institutions have stepped away. The ICBC's annual general meeting begins Tuesday in Beijing and Hong Kong. "Based on the serious findings of the [African Development Bank] hydrological impact report, which has now been published, ICBC should reconsider their funding of the Gibe 3 Dam," Peter Bosshard, Policy Director at International Rivers tells CBS News. The Chinese government is pressuring the country's state-owned banks to invest in more projects outside of China. As Chinese banks extend their interests into international territory, activists from all over the world will likely find themselves spending more time in Beijing.